Today's stitch is fun and different, while also deceiving. It's nothing but straight stitches yet delicate diagonal columns emerge. The columns consist of pairs of stitches (on the horizontal axis). The pairs are over five rows and over two rows or pairs of two stitches over two rows. To make the columns work, it's really important to remember to leave an empty row in between the columns. The stitched sample is from the sky of a sweet little Christmas ornament and uses Petite Silk Lame. It's not quite as obvious as the diagram. That said, I love how subtle and elegant the stitch is. This stitch would make a great tabletop, using two colors of Burmilana in alternating columns. It would also make lovely, yet discreet, water, especially in a wide but short space. Don't be afraid to flip it 90° and use it for a different sky, greenery, or walkways. I added a disclaimer about diagrams at the bottom of all recent blog posts. Today's diagram is a perfect example of that disclaimer. 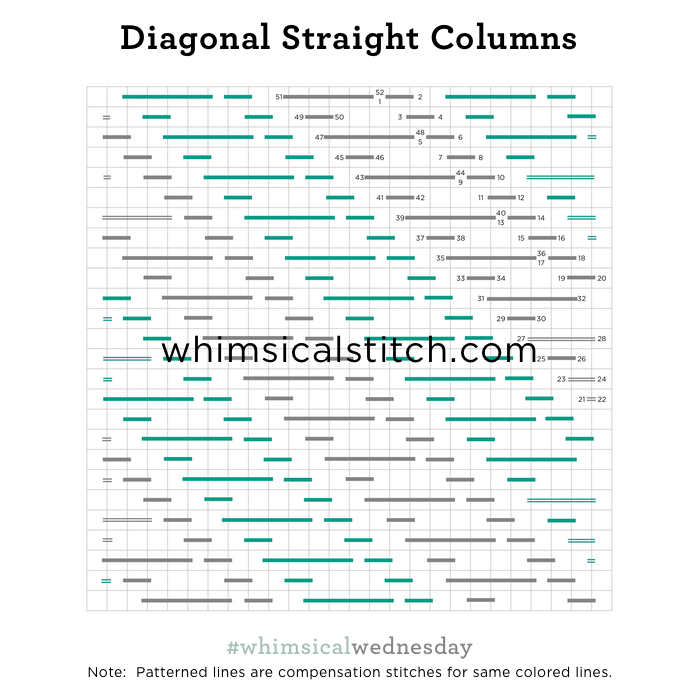 The colors in the diagram help differentiate the pattern and illustrate the diagonal columns.